So has the day of departure from Paradise arrived. We have to leave the white beach and move south to the asphalt jungle. 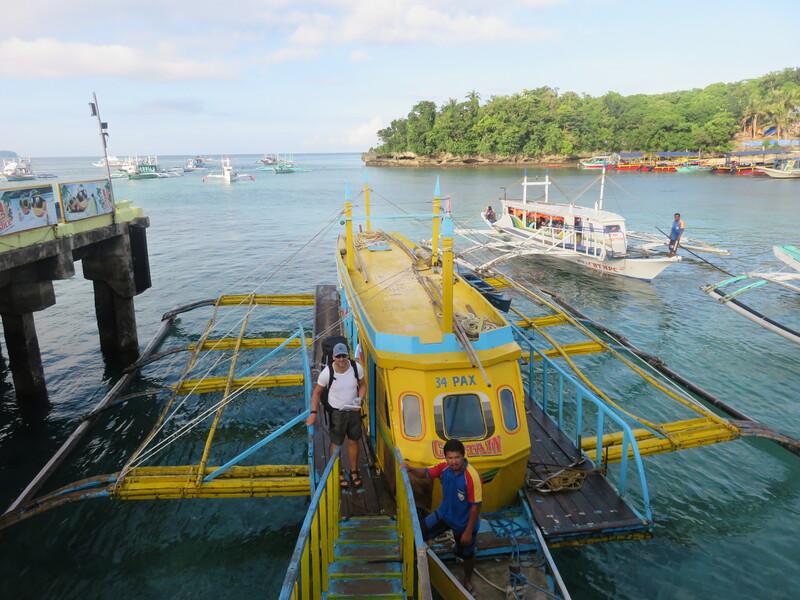 Boracay has been so much better than expected, and I had high expectations. The sand, water, atmosphere, we’ll just about everything has been up to standard or above. We had set the alarms at 5:45 to get read for pickup an hour later. Katja has had an awful night with nearly no sleep. It looks like she’s either coming down with a cold or ate something that doesn’t agree with her. Let’s hope it passes quickly. As she has been twisting and turning in bed all night I have been happily dreaming of sun and fun. Not fair, I know. We spoke some more with Paolo, the waiter I mentioned yesterday. 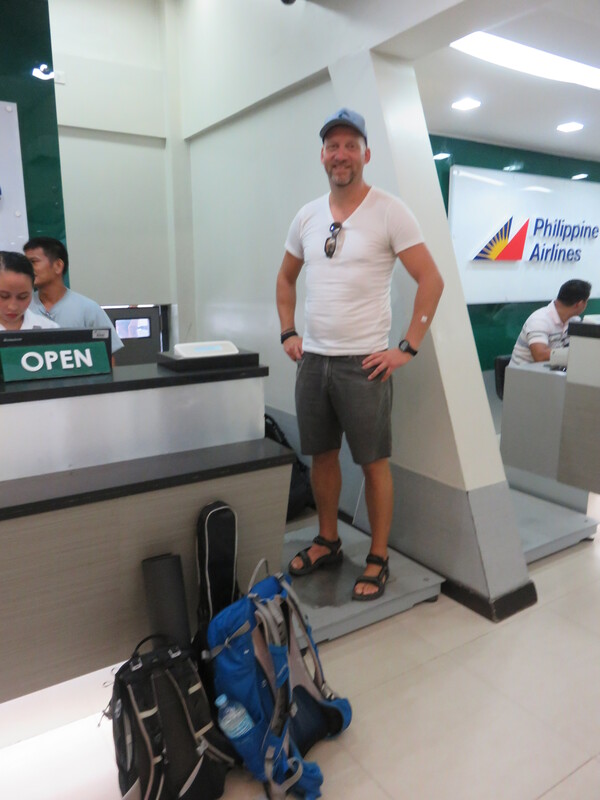 He came to us with a website http://www.travelbook.ph which seems to be a site the Filipinos themselves use for best prices on hotels. We’re gonna check that out as it might save us a few bucks on our stay here. We got picked up as requested and guided all the way to the airport check in. The ferry ride this morning was of the old school style compared to the “modern” boat we had when we came here. It worked as supposed and we crossed the strait with no problems. Checking in is a game of its own. Here in Caticlan airport it’s a weight limit on the planes and every passenger is weighed in together with the carry on luggage. We do fly small propelled aircrafts so it might make sense. We got all our papers in order, but the level of bureaucracy here is impressive. You need to buy one ferry ticket in one stall, move around the corner and buy terminal fee. Then the tickets from these two will be collected at different places. At the airport it’s another terminal fee as well. Outstanding way of keeping people employed. Right now we are waiting for the plane to arrive, and got news that’s it a bit delayed. And just now it started raining cats and dogs. If this will have any impact on our departure is to early to tell. Hopefully not. Luckily the rain came on our traveling day, and not a beach day. Although I suspect this island takes some of the rain that doesn’t land on Boracay. The airport is the seventh most busy in the Philippines, and there are a lot of flights in and out during a day. Amazingly it all seems to work pretty well even though it looks simple and uncoordinated for us. We have been given a contact in Manila by Kent. We have sms’ed to and from yesterday and his friend again is a taxi driver. He will pick us up at the airport and take us to the hotel. From there we’ll see if Katja is up for training in Luneta park or if I have to go by myself. Katja went out of the departure hall to see if she could get a can of coke. Having disposed of the breakfast already she needed something to fuel her up. When I came in through security I had a one liter bottle of water, no problem. A can of coke? Nope, not on my watch. So she got a gulp or to out the two cans she bought before disposing of them. 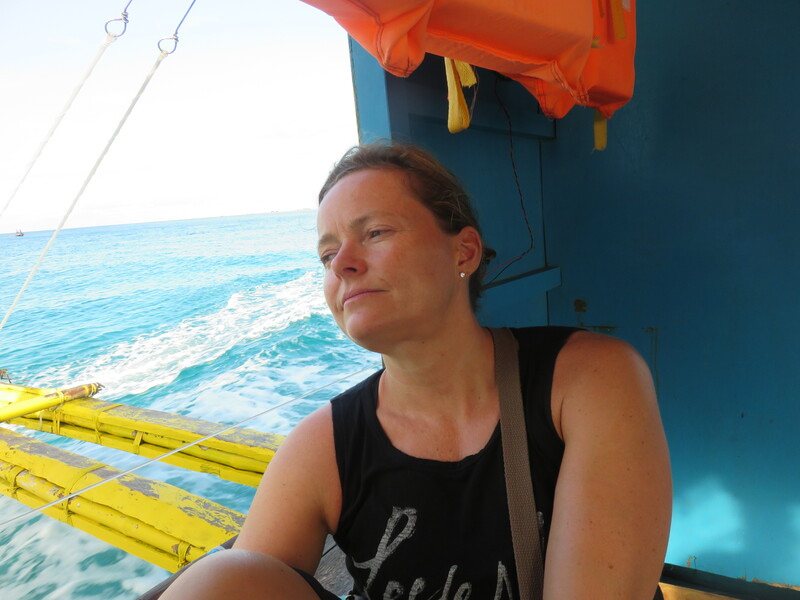 Katja slept all the way down to Manila and felt better when waking up. We met Gerald at the entrance to the airport and instantly got a new friend. He had organized a taxi for us (a friend of the friend who drives taxi) and we set a course for the hotel. Well installed we quickly changed into training gear and headed down again. We grabbed lunch at Hooters, which was a huge disappointment. (Not the hooters but the food.) From there we took a taxi to Luneta park to train some Arnis (Kali/Escrima) with Grandmaster (GM) Henry Espera in “Rapido realisimo”. It was just awesome! I had the Grandmaster personally teaching me drills in stick work, and then more conceptual empty hand with Katja and me. Katja got a lot of work done with Fernando “the Librarian”. A nickname he has gotten because he remember all drills and pair works. GM Espera has a lot of cool concepts I look forward to applying on friends when I get back. After two hours of training we were pretty beat. GM did some Hilot (filpino healing system) pressure point techniques on us for opening and relaxing the shoulders. Im open to all such things and were positively surprised of the result. I have a good feeling of how my shoulders work, especially after the surgery I underwent in the right one. The upward stretching of the arms is also common in Yoga and I have struggled with being able to really stretch my as up alongside my head. They have always been a bit bent. Just after GM was finished pressing and bending I could raise both arms straighter than I can ever remember. As there is no shortcut for anything it will probably not last by just one go, but it was cool to experience. We’ve heard that he is genuinely interested in his students health and it was he who commented on my right shoulder. Good eye on a good man. Katja had slept little and eaten even less and I to was worn out from the travel. We therefor went to take a coffee nearby and by chance stumbled into Mabuhay Restop. A little cafe and museum that also provide organized tours in Voluntourisme. This is where people do volunteer work as part of the trip. I don’t think we’ll join in on that, but she just came back from El Nido herself. All people ask us if we’ve gone there, so I guess we are destined to do it before moving on from the Philippines. She showed us personal photos from her trip and gave us info on places they use when traveling there. 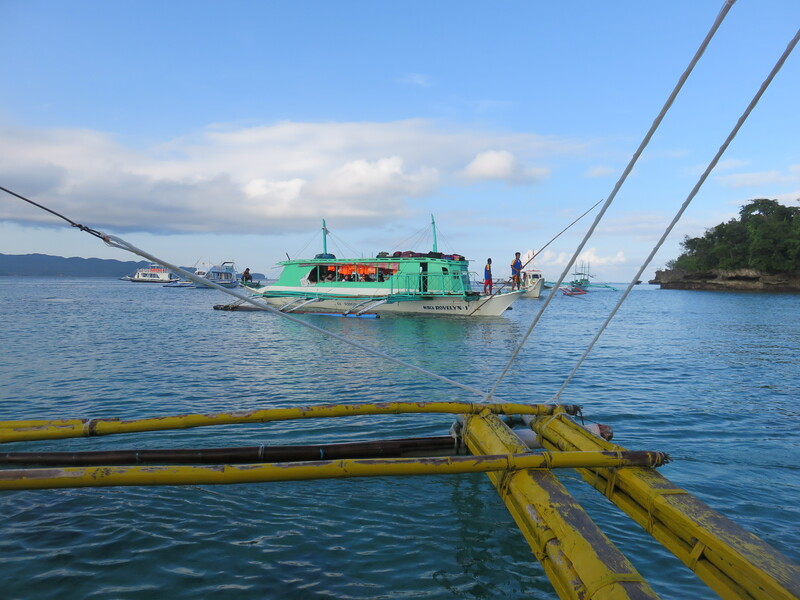 We’re gonna check those out and a plan for experience Coron and El Nido is taking form. Stay tuned for more. Gerald got us safely tucked away in a cab and we went back to the hotel. Just outside our doorstep is a pharmacy and we got some spills for Katja’s brewing cold. In this country you get the number of pills you need, not the whole box. Katja got “prescribed” 3 pills a day for 5 days = 15 pills. Don’t worry, they are in normally sealed containers and we can google all the side effects. But it shows how you can reduce waste and keep it affordable for people with less means. We got some fruits and remedies for tomorrow’s breakfast at the supermarket and grilled chicken and pork for dinner. 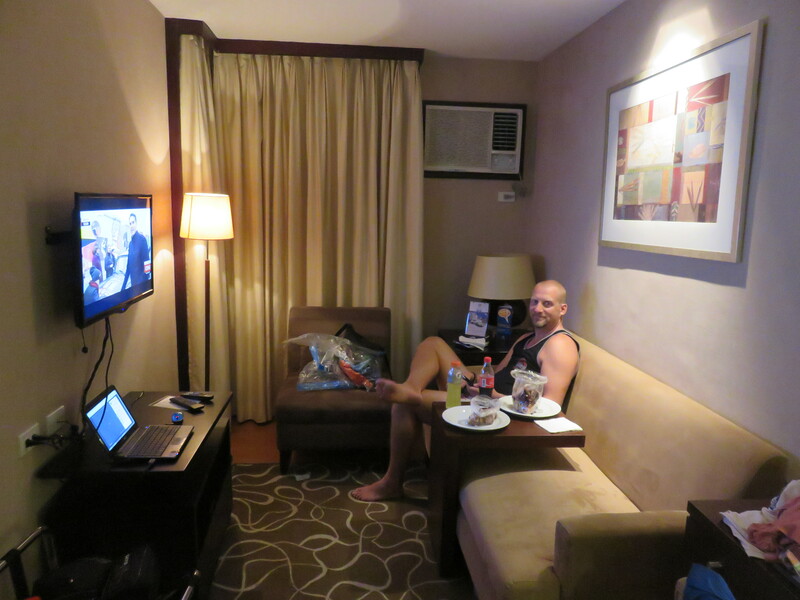 We were just finished eating while watching a TV series when we talked to Kent again. It was he who set us up with Gerald and now is helping us further with different things. His help is invaluable to us. He has a good name around here and has connections to a lot of people. We are talking about a trip south to Batangas and north to the rice terraces. As of now the tips we get from Kent plus his connections will make it easier and more interesting, I’m sure. We’ll tell you about it later. The martial arts community is very helpful and Katja and I also try our best in that regard. I honestly think that the best thing you can do for repaying a good deed is to find another who needs help and just do your best. 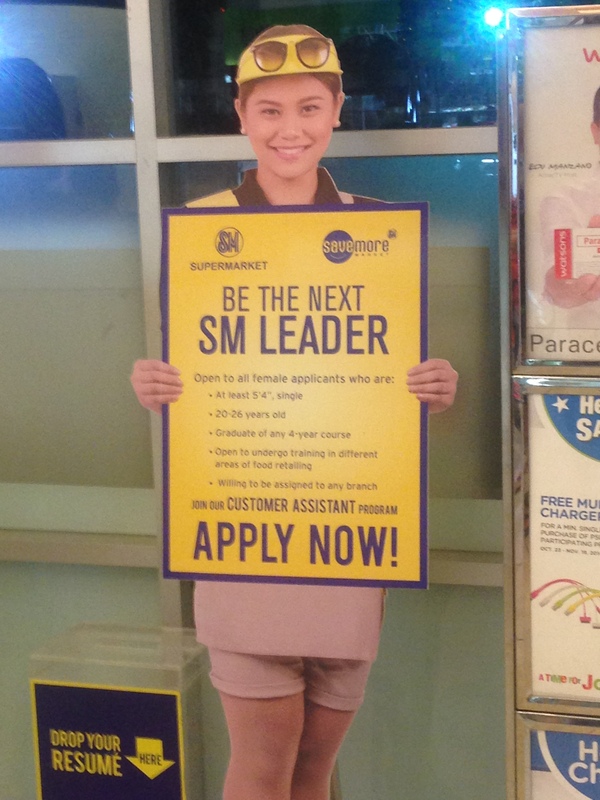 And regarding the supermarket… I came across this add standing there for recruitment of female managers. It’s a good thing our society has come a bit further when selecting candidates. Minimum height and single as qualifications? Yeah, right! Katja is now sleeping with pills of unknown origin and probably stronger than anything sold in Norway. I’m just finishing this post before its lights out for me too. Remember to make someone smile today and keep paying good deeds forward. Categories: Philippines | Tags: Boracay, Manila, Martial Arts, Philippines | Permalink.